This article is about the magazine. For Nintendo's rewards program, see Club Nintendo (rewards program). Club Nintendo was Nintendo's official, bimonthly published magazine in Germany, with issue 1/1998 also in Austria and Switzerland. It can be seen as the German equivalent to the American Nintendo Power. The first issue was published in 1989. Its precursor called Play Nintendo was already published in November 1988. This one had only eight pages and was more a form of a newsletter. Until 2001, the number of pages greatly increased throughout the years. In 2000, one issue of Club Nintendo had over 80 pages. In 2001, because of redeployment at Nintendo of Europe, the old staff of the magazine was laid off and a German publishing company called Computec Media carried it on with a new staff. The new incarnation had far fewer pages and was aborted with issue 4/2002. Club Nintendo is also the name of official Nintendo magazines from various other countries, mostly also aborted. One which does still exist is Club Nintendo México, official Nintendo magazine in Latin America. A very special feature of the magazine were the Nintendo comics, most of them exclusively released in the magazine. The comics in the issues from 1991 to 1998 were drawn by Japanese manga artists (Mangaka), while the stories and texts were written by the German editors of the magazine themselves. In 1999 and 2000, they were replaced by a comic series called N-Gang, which are completely German productions. N-Gang features teenage human characters as protagonists, but still a lot of appearances of the Nintendo characters. While some of the comics are closely related to the games, there are also stories which are rather obscure and take place on Earth instead of the usual environments of the various Nintendo characters. Also 3rd party characters do appear both in the N-Gang and the prior comics. After 2000, when the magazine was published by Computec Media, no more comics were released in Club Nintendo. Comics with no characters from the Mario series as main characters are excluded. The N-Gang is described in a separate article. 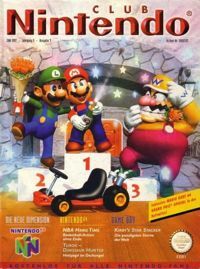 Beneath the regular issues, also special issues were published, mainly to promote new Nintendo games and other products. A choice of different issues showing the development of the cover design. Reverse of Yoshi's Story Comic. This page was last edited on April 3, 2019, at 14:37.